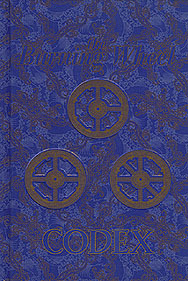 The Burning Wheel Codex stands as the companion volume to the award-winning Burning Wheel Fantasy Roleplaying System. Beginners and veterans alike will see the game in a new light and find their campaigns enhanced by this fantastic new material. The tome offers insight into building settings and adventures for your Burning Wheel campaigns, helpful commentary on writing Beliefs and Instincts, a trove of magical artifacts, 12 new magical arts and five new sets of lifepaths: the Wizard Burner, Dark Elves, Roden, Trolls and Great Wolves. Truly a grimoire worthy of wizards and warriors everywhere. Presented in the same easy-to-read style as the Burning Wheel core rules, the Codex condenses, distils and refines the experience of ten years playing one the greatest fantasy roleplaying games ever published.